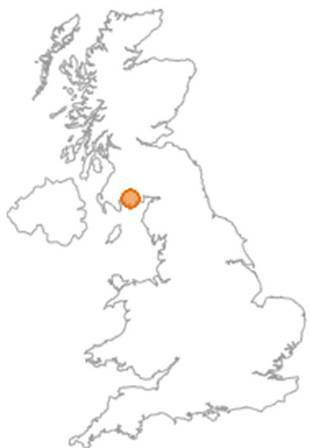 Castle Douglas is located in Kirkcudbrightshire which is in south-west Scotland. The A75 Trunk Road running from Stranraer in the west to Gretna in the east bypasses the town. The most convenient way to get to the school is by road as there are no close rail links to the town. Follow A75 to roundabout at east end of Castle Douglas bypass and take first exit signposted Castle Douglas (A745). Follow A745 into Castle Douglas. Take first exit at small roundabout and continue along Ernespie Road (past Tesco store on left) to large roundabout and take second exit into Queen Street. Go past Crown Garage (Shell) and take second left (just before Pedestrian Crossing) into Jenny’s Loaning. The school is 400 metres on the right. Follow A75 to roundabout at west end of the Castle Douglas bypass, take the third exit and follow B736 into Castle Douglas. The B736 runs along the north side of Carlingwark Loch – take the first right at the end of the loch into Queen Street. Follow Queen Street uphill and turn immediately right after the Pedestrian Crossing into Jenny’s Loaning. The school is 400 metres on the right. Follow A713 into Castle Douglas along Abercromby Road to crossroads junction with King Street – Douglas Arms Hotel is on the left. Continue straight over crossroads into Whitepark Road and turn left at next crossroads junction – Kings Arms Hotel is on the left. Follow Queen Street uphill and turn immediately right after the Pedestrian Crossing into Jenny’s Loaning. The school is 400 metres on the right. Follow A745 into Castle Douglas. At large roundabout (just after Fire Stattion on left) take first exit into Queen Street.